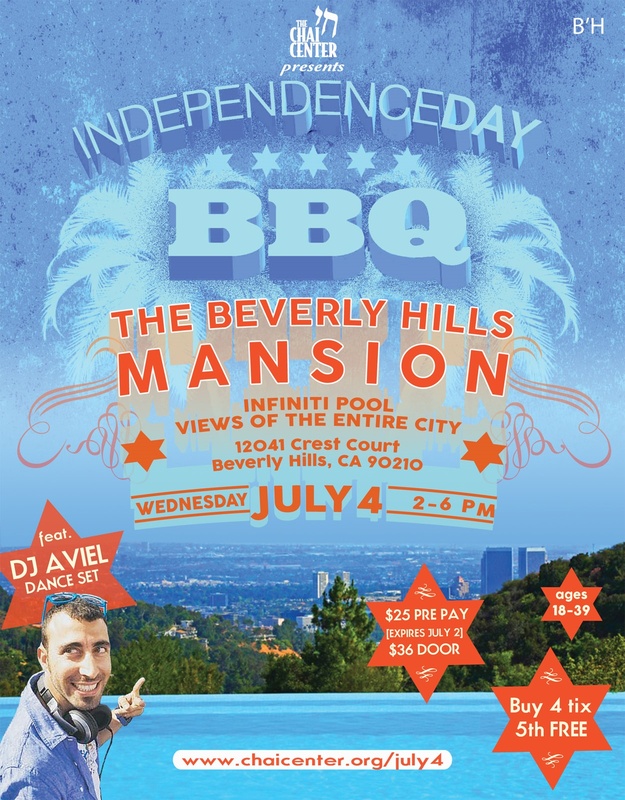 THIS BEVERLY HILLS MANSION BELONGS TO YOU ON WEDNESDAY, JULY 4TH WITH 100’s OF JEWISH YOUNG ADULTS. THE CHAI CENTER presents the largest Jewish Young Adult Independence DAY BBQ! FEATURING: THE BEVERLY HILLS MANSION. Promo Valid till Jun 25th! Buy 4 and the 5th ticket is on us!! For the promo tickets please email info@chaicenter.org the list of the 5 names and emails! All the sales are final and we have the right to refuse anyone that is under 21 or above 39.